Animated STAR TREK - "The Time Trap"
Caught in an ion storm, the U.S.S. Enterprise and a Klingon battlecruiser are drawn into a time warp called the Delta Triangle and must cooperate in order to escape it. PSA epilogue for "The Time Trap"
The story featured in the August 1972 Gold Key STAR TREK comic had the identical plotline and many other details as this episode. The first draft script for "The Time Trap" was written by Joyce Perry on October 19, 1973 - over a year after the comic story was published. This episode's premise of starships accidentaly passing into a nigh-inescapable limbo world was again employed in the February 2001 STAR TREK: Voyager episode "The Void". The solution in this latter story was again that cooperation was the only means of escaping the netherspace. 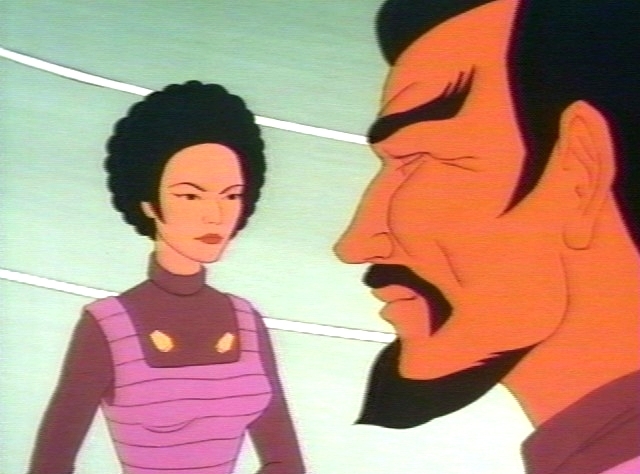 This episode, which was the last animated episode to feature Klingons, is also the final appearance of the smooth-foreheaded Klingons. Six years and two weeks later, STAR TREK: The Motion Picture debuted in theaters and ushered in the era of the crab-headed "new-look" Klingons. There was a dialog error in this episode: Kirk stated the stardate as 52.2, then later in the episode said it was 5267.6. In the final script for this episode, the stardate is given as 5264.2. When the dialog was recorded, Bill Shatner accidentally left out the "64". The S.S. Bonaventure, the first starship with warp drive, was seen in this episode. Klingon Commander Kor was seen in this episode and was originally seen in the original series episode "Errand of Mercy" which happened to be the first appearance of a Klingon in STAR TREK. Kor was played by the late John Colicos (pictured) in the original series but was voiced by James Doohan in animated form. 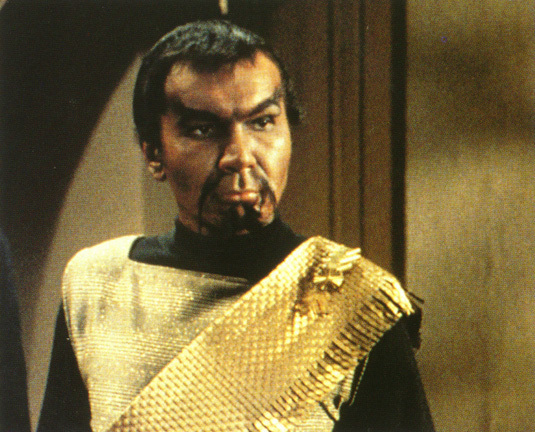 John Colicos did later reprise his role of Kor in three episodes of STAR TREK: Deep Space Nine: "Blood Oath", "The Sword of Kahless" and "Once More Unto the Breach." The Elysian council included a Kzinti male. This is one of three animated episodes that mentions or shows the Kzinti and thus crosses over into Larry Niven's Known Space universe. The Kzin in this episode had no dialogue. Many, many ships were seen in this episode, which would have been very expensive to do live action. James Doohan did the voices of no less than six characters in this episode. This episode marked only the second appearance of a female Klingon in a STAR TREK episode. The first was Mara, Kang's wife in "The Day of the Dove." The lovely yet treacherous Kali (pictured) from Kor's crew had no dialogue but that didn't stop her from planting a bomb in the Enterprise's engine room. The name, Kali, comes from the name of the four-armed Divine Mother in the Hindu religion. In that pantheon, Kali is the goddess of time and of the transformation that is death. A Gorn was a member of the Elysian Council. The territorial Gorn race was first seen when Kirk and the Enterprise crew faced them in battle in the original series episode "Arena." In this episode, a woman was seen on the Elysian council wearing what was apparently an early Starfleet uniform. One can conjecture that it is the uniform worn by crewmembers from the S.S. Bonaventure which was lost into the Delta Triangle around 2115. The Uniforms & Insignia page within this site has a section devoted to this early uniform. Joyce Perry, this episode's writer, has written for many television show from the 1960's into the early 1980's including episodes of "The Man from U.N.C.L.E. ", "Petticoat Junction", "The Lucy Show", "Bonanza", "Kung Fu", "Ironside", "Land of the Lost" (2 episodes), "Eight is Enough", "The Waltons", "Flamingo Road" and "Fantasy Island (1983)." In 1978 and again in 1979, she was nominated for a Daytime Emmy in the category of Outstanding Writing for a Drama Series for her work on "Days of Our Lives." Ms. Perry passed away in 1996 at the age of 59. In the November 1998 episode of STAR TREK: Deep Space Nine, "Once More Unto the Breach", Kor mentioned that he served aboard the Klothos, a D-5-class battle cruiser sometime when the Klingons were still the adversaries of the Federation. 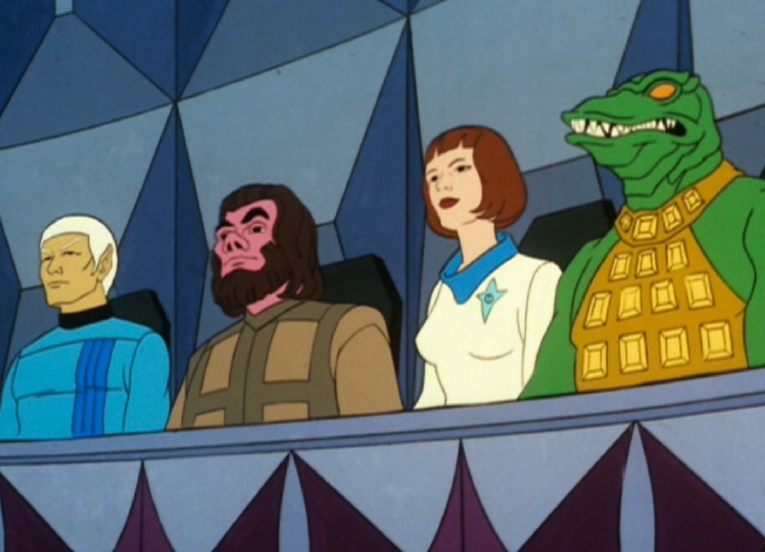 Animated STAR TREK fans know that Kor commanded the Klothos in the animated episode "The Time Trap." This is a direct tie-in, which makes the animated series that much more canon! Devna, one of the lead members of the Elysian Council, was an Orion woman who performed a dance for the new arrivals in the timeless void. 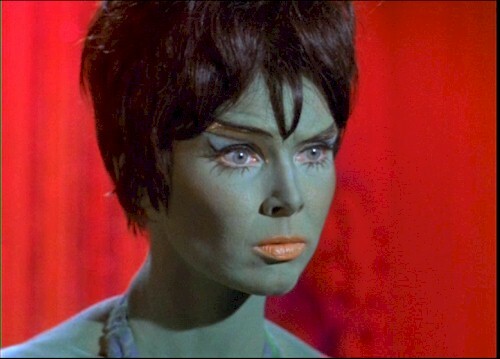 In the Original Series episode "Whom Gods Destroy" (TOS) we saw the Orion woman Marta (pictured), portrayed by Yvonne Craig, perform a dance for Kirk and Spock. There is a page that focuses on the Klingon Battle Cruiser that was featured prominently in this episode. 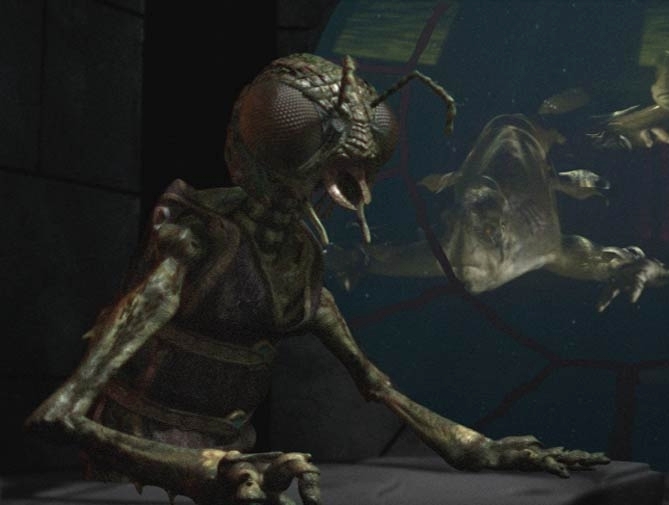 The Insectoid being seen on the Elysian council in this episode may be a member of the Xindi insectoid species (pictured) seen in several episodes of the STAR TREK: Enterprise television series. A Limited Edition Collectors Cel inspired by this episode was once available from Tuttle Enterprises. The cel was number ST-14. "The Time Trap" was novelized by Alan Dean Foster in Star Trek Log Four published by Ballantine Books in March 1975. Also novelized in the book was "More Tribbles, More Troubles" and "The Terratin Incident". STAR TREK Novel is Direct Sequel to "The Time Trap"
In September 2003, STAR TREK novel authors Dayton Ward and Kevin Dilmore contacted me to inform me that they were working on a new Starfleet Corps of Engineers novel that would be a direct sequel to the Animated STAR TREK epsiode "The Time Trap". I was thrilled, since that was my favorite animated episode. But, there was more to their missive. They also wanted to know if it would be okay to name a character in the book after me! One of the Starfleet personnel in the tale, who was to work hand in hand with the S.C.E. characters, was to be named Curt Danhauser - as a sort of homage to me for my efforts to give long-overdue respect to the forgotten series by creating this website and also for my work on the Animated STAR TREK Trading Card set. I said "Yes", of course, and to make a long story short, one year later, in September 2004, their book was published. It is entitled STAR TREK - Starfleet Corps of Engineers #44: Where Time Stands Still and it is a really great read. In addition to its being an exciting adventure story, it is also important because it is the first novel published by Pocket Books to directly acknowledge and tie-in with events from the Animated STAR TREK series. It also reconciles some of the events of Starfleet's early history as described by the Enterprise and Animated STAR TREK series. I encourage all lovers of good adventure and especially fans of the Animated STAR TREK to get Starfleet Corps of Engineers #44 - if only to find out the fate of my namesake. Below is a synopsis of the book and a handy link to Amazon.com's page for the book. Before the twenty-fourth-century adventures of David Gold, Sonya Gomez, and the crew of the U.S.S. da Vinci came the more rough-and-tumble Starfleet Corps of Engineers of the twenty-third century. In the wake of an incident involving the Starship Enterprise and the infamous Delta Triangle, Lieutenant Commander Mahmud al-Khaled and the crew of the run-down U.S.S. Lovell must "open" the Triangle -- and also find a lost generation ship that was last seen entering the phenomenon. But the mission grows even more complex when the Gorn arrive, demanding -- at gunpoint -- that the Gorn criminals inside the Triangle be returned to them. A gripping new twenty-third-century drama in the tradition of Foundations! During their adventures near the Delta Quadrant, the crew of the U.S.S. 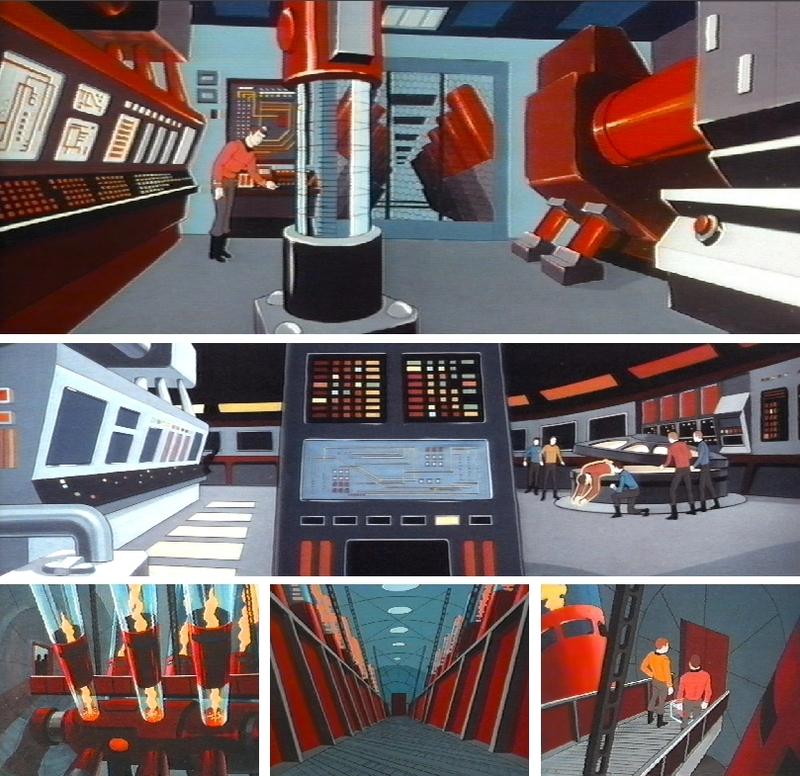 Lovell work with the crew of the science starship U.S.S. T'Saura including science officer Lieutenant Commander Curtis Danhauser!